The World Event Which Launched Seattle Into a Postmodern Orbit, 50 Years Ago Today. 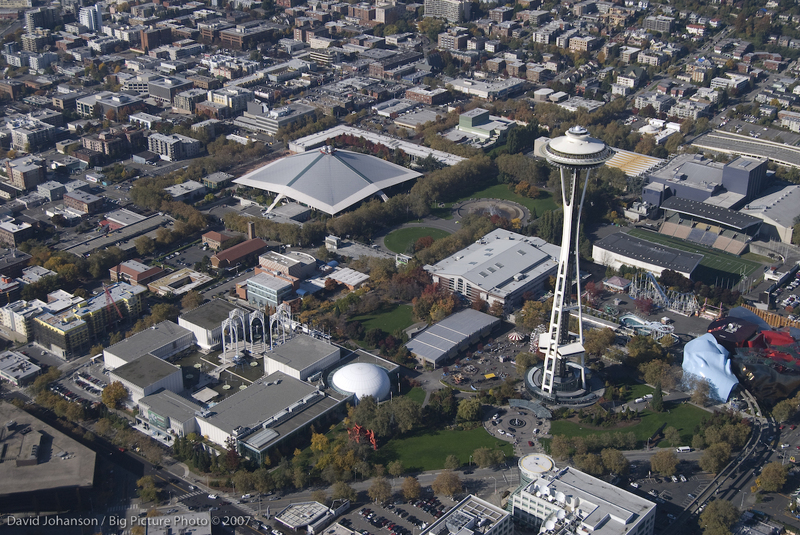 On this day, April 21st, 1962, Seattle’s Century 21 World’s Fair opened the doors for its national and international visitors. Eventually, almost 10 million guests attended the entire event to — “imagine a futuristic tomorrow,” which promised technological wonders for improved living and for promoting world harmony. Century 21 Fair Exposition Logo. 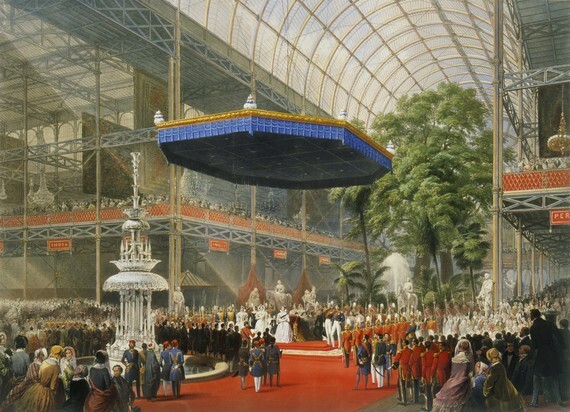 The 1851 London World’s Fair, which took place in London’s Crystal Palace, was the vanguard of this type of global gathering. The industrial age was in a mature stage of development, offering new and exciting forms of technologies. In this era, people became aware of time-and-space being compressed — due to steam-power’s ability to hasten long-distance travel with the locomotive and steamship. As the World’s people experience shrinking obstacles towards bringing distant nations and cultures together—the creation of global fairs was created to promote industrial development and international exhibits. Seattle’s first World’s fair — Alaska Yukon Pacific Exposition in 1909, occurred near the peak of an industrial age, which helped Seattle obtain national name recognition. 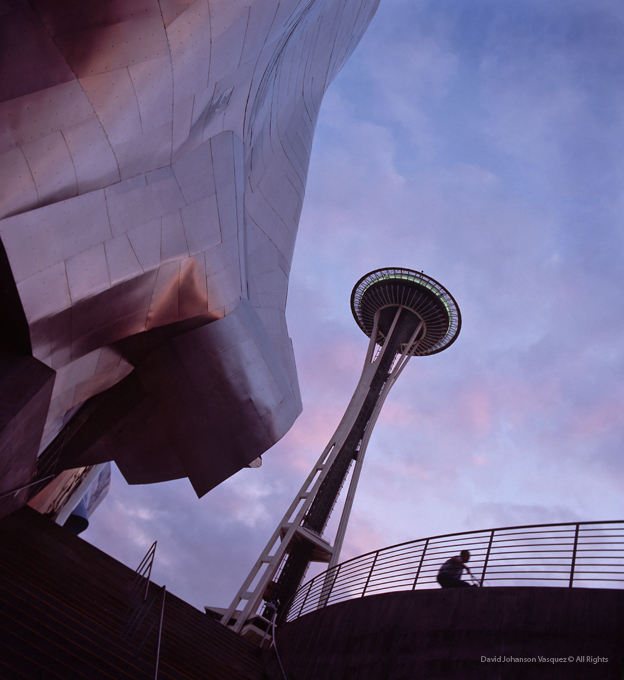 The Space Needle, an iconic landmark from Seattle’s 1962 Century 21 World’s Fair. 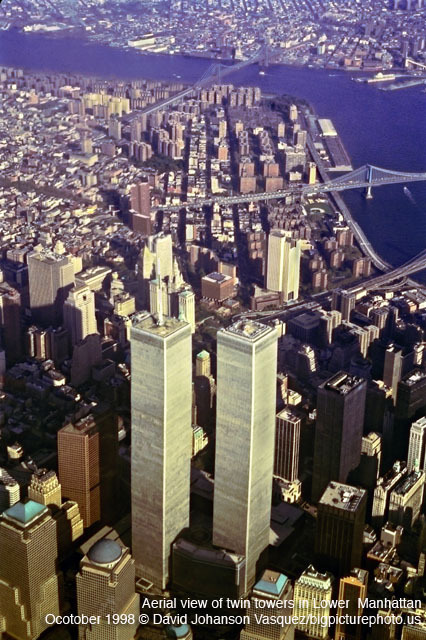 Significantly, the Century 21 World’s Fair was created in an emerging postmodern era. The Fair was remarkably successful with a number of tangible results, notably: it was one of the select few world event of its kind, which made a profit and most importantly, it lifted Seattle out of its perceived provincial setting, and placed it onto a world stage. The timing was ideal for the city’s economic development trajectory. With Boeing Aerospace as a Seattle-based company, it benefited from the international exposure, at a time when the postmodern world began to embrace jet travel for global access. Seattle Center with Mount Rainier in Background. Optimism and enthusiasm associated with the 1962 World’s Fair was authentic, however, in the big picture, a dark shadow was growing with super-power tensions. As the cold war thermometer was nearing a boiling point, a serious situation was escalating. President Kennedy’s excuse of having a cold for not attending the Century 21 closing ceremony in October was a ruse — actually his efforts for de-escalating the Cuban Missile Crisis were urgently required. As a result of averting a nuclear war over Cuban missiles, President Kennedy successfully presided over the United States, United Kingdom and Soviet Union’s signing the Comprehensive Nuclear Test Ban Treaty (CTBT) in the following year of 1963. Ironically, it was the Soviet Union, which created the theme of science for Seattle’s Century 21 World’s Fair. On October 4, 1957 the Russians launched Sputnik, the first orbiting man-made satellite, which gave them an edge in space development. With the Soviet’s apparent satellite success, Americans feared they were falling behind in science and technology; as a result of tech envy, a theme of science became the framework for Seattle’s Worlds Fair. From this time forward, the U.S. Set goals to be leaders in space exploration and technology development. Elliott Bay with Seattle Center and Mount Baker in background. The shock-wave effect created by Sputnik, awoke America from its complacency of 1950s idealism. Now, a sense of urgency was created in looking for optimism within the futuristic Technology of tomorrow. This quest for all things technological, was the fuel which Seattle used for launching its World’s Fair. Late in 1957, the title: Seattle Century 21 World’s Fair was selected as the brand name to help promote America’s vision of optimism in a technological future. 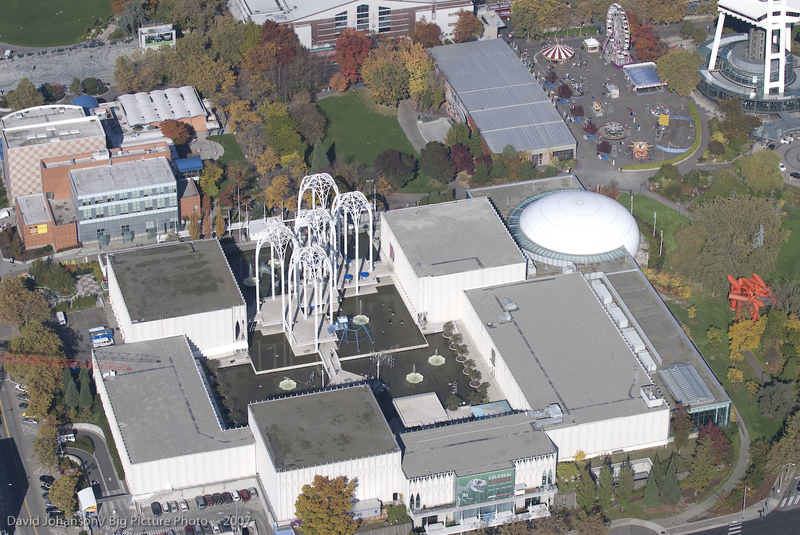 To champion this cause, Albert Rossellini, Washington State Governor from 1956 to 1965, selected an exceptional group of business and civic leaders for a commission which successfully acquired local and national financing for the Seattle World’s Fair. Governor Albert Rossellini, on Veteran’s Day 1961. Governor Rossellini, a Pacific Northwest civic titan, had the vision which helped develop the region into a world-class, economic dynamo. The Century 21 World’s Fair, along with the state’s modern transportation infrastructure , and post secondary education developments are just a few examples of Albert Rossellini legacy. 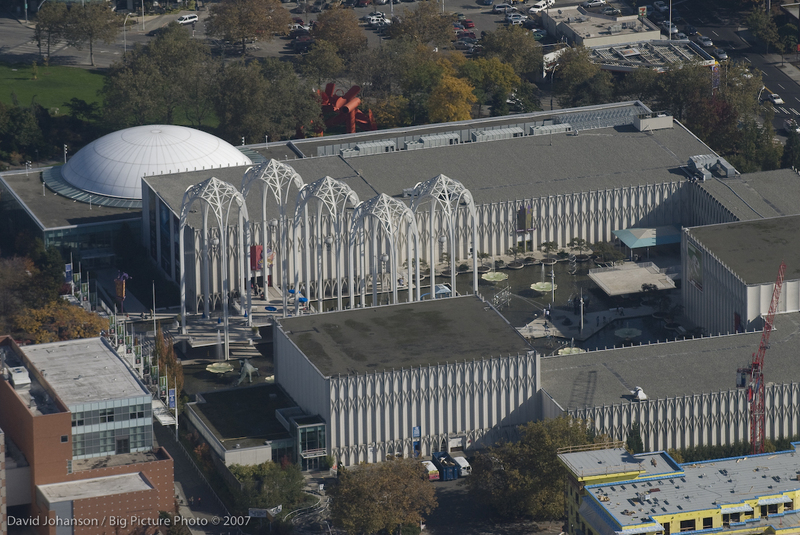 One more fascinating contribution from Governor Rossellini was his contribution in bringing the “King of Rock and Roll” to Seattle’s World Fair. Albert Rossellini actually pitched the idea to MGM, for making a movie with Elvis Presley (click on the video link ↓ ) It Happened at the World’s Fair — (Movie Clip) Happy Ending Enlisting Elvis, a mega superstar, to help promote the Fair in a movie was a brilliant marketing move, with true creative vision! 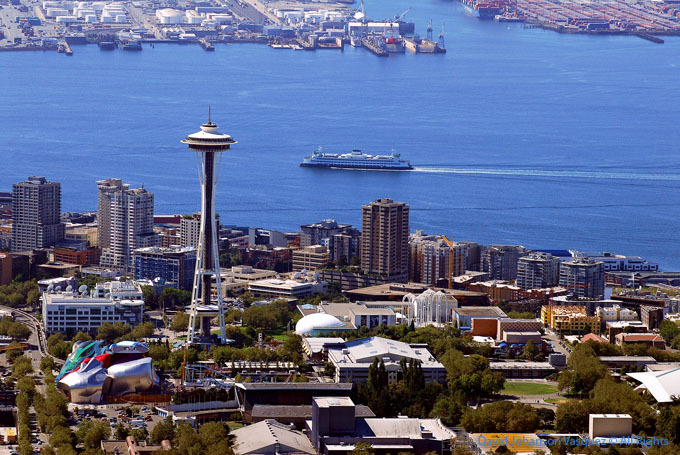 Most impressive icons of the Century 21 Fair are the Space Needle and Monorail, which went on to become revered Seattle landmarks and its biggest tourist attractions. The ever popular Seattle Monorail is gliding past Paul Allen’s EMP building. Internationally, the Space Needle is a more recognizable symbol of Seattle, than the city’s actual name or any other single reference. The inspiration for the Space Tower as it was initially called, came from a napkin sketch by C21 chairman, Eddie Carlson of a 400’ TV Tower with a restaurant in Stuttgart Germany. The idea of a tower with a “flying-saucer” shaped restaurant at the top, was presented to architect John Graham, who added the concept of a rotating restaurant to allow viewers a continuous change of panoramic views. Victor Steinbrueck, professor of architecture at the University of Washington and architect John Ridley produced concept sketches which featured an elegant tripod, crowned with a saucer structure observation deck. 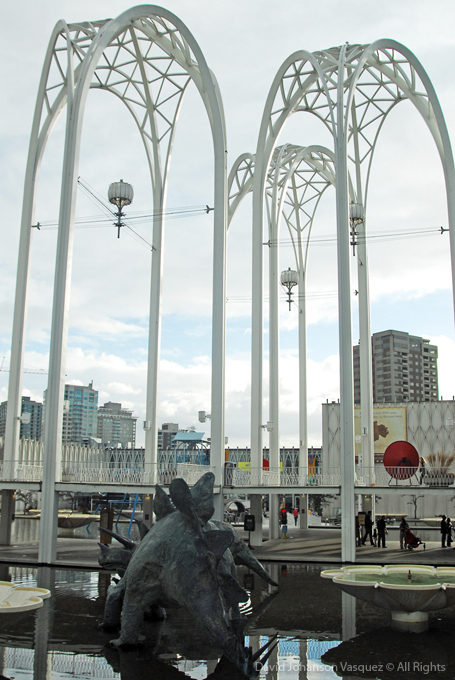 Minoru Yamasaki, a first-generation Japanese American, born in Seattle, was the main architect, along with Seattle’s NBBJ Architects chosen in designing the U.S. Science Pavilion, today’s Pacific Science Center. 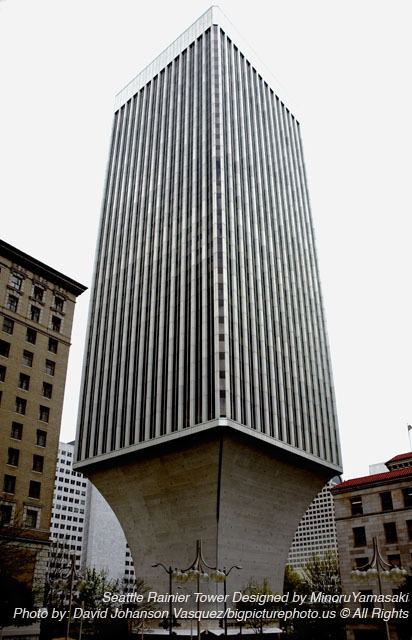 Minoru Yamasaki’s innovative, graceful design was also used for Seattle’s most daring piece of architecture, the Rainier Tower, supported by a gravity defying inverted pedestal! 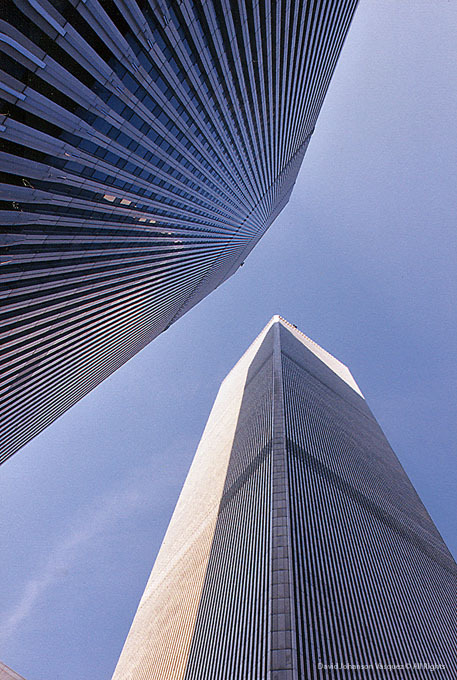 Seattle IBM Building designed by Minoru Yamasaki, was used as the model for NYC WTC Twin Towers. 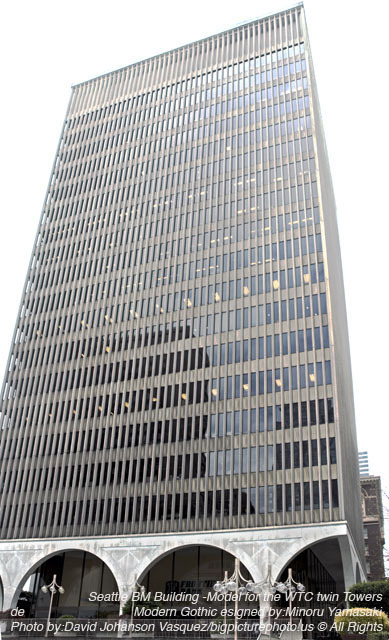 An example of Yamasaki’s “gothic modernism” style. Twilight view of Space Needle and Pacific Science Center.